Dedicated to style, these Paolo Vandini designer lace-up shoes are a unique, high fashion option, ideally suited to men looking for a premium finish and quality craftsmanship. The Teilo leather shoes from Paolo Vandini have a black faux croc skin effect embossed with subtle, textural ridges on hi-shine waxy baby buffalo leather uppers. The lace-up of these premium, men's leather shoes from Paolo Vandini continues the quality feel with a formal, 4-eyelet arrangement; thin, matching brown rounded laces can be seen spiralling through blind eyelets to provide a comfortable, customised fit. Inside, the lining is also made of smooth leather, while the insole is padded to provide a premium level of comfort and finish. Stitching on the shoes is high quality and perfectly compliments the appearance of the leather, blending in for minimal distraction from the already powerful texture of the crocodile-skin. A block heel standing 3cm (1 inch) tall completes the mens shoe. These premium, men's leather shoes from Paolo Vandini are a perfect example of quality craftsmanship which all men look for in their footwear. 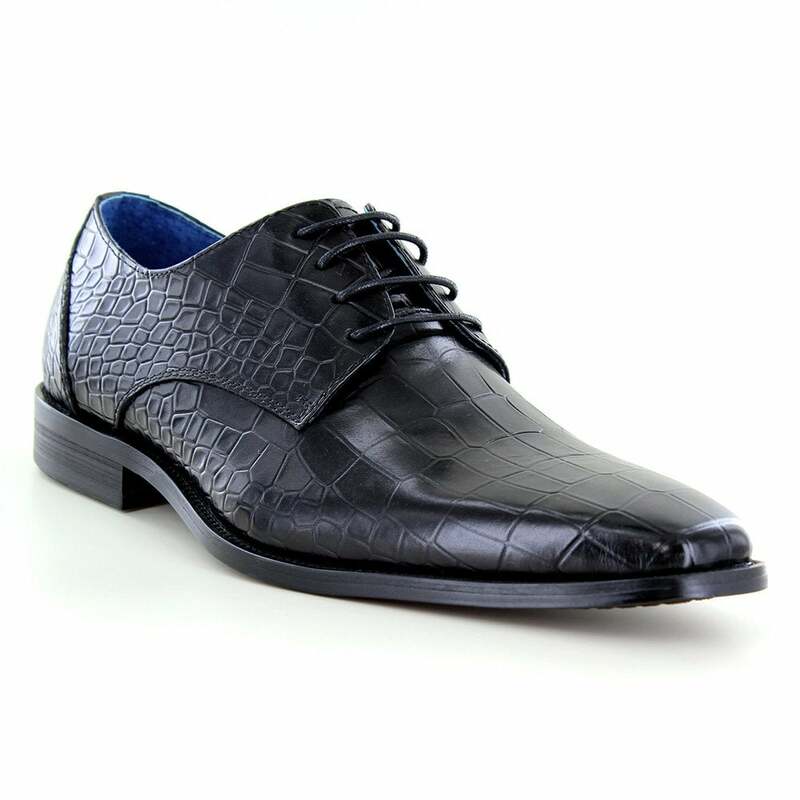 The Teilo Mens Leather Faux Crocodile-Skin Lace-up Shoes are a perfect addition to any formal or high fashion outfit!